Independence came into being in 1850 as the settlement of a dispute about where to locate the county seat. At that time, a controversy arose between the residents of Old Town and people of the Elk Creek area. Each group wanted the seat in its area. 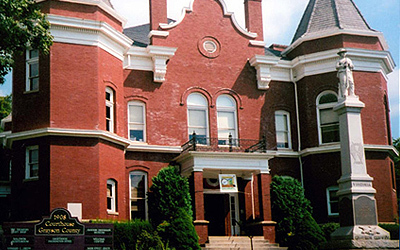 The final decision, made by 3 commissioners from adjacent counties, was to locate on the site favored by a group of independents and to call the town Independence. These commissioners hiked to the top of Point Lookout Mountain and looked down into a grove of trees where 5 streams met and decided that would be the site for the new town. Grayson County was formed in 1793 from part of Wythe County and was named for William Grayson, one of Virginia's first 2 senators. Isolated by its topography, Grayson County saw little action during the Civil War, but after the war, the period of its greatest economic growth and prosperity began. Railroads were built; power dams and sawmill industries created jobs and farmers grew cash crops and livestock. The county's first textile mill was built at Mouth of Wilson, and Col. F.H. Fries harnessed the power of the New River for a second mill. The most accessible timber and iron ore was depleted before World War I and many prosperous boomtowns nearly disappeared. The July high temperature is around 82 degrees, and the January low is 22 degrees. The area also receives about 42 inches of rain per year, with an average snowfall of 24 inches. Population 15,533. Land area square mile 442.18. Persons per square mile 35.1. Median household income $32,178. A mecca of old time and bluegrass music, Grayson County is home to many accomplished luthiers and an abundance of musical talent. You’ll enjoy many seasonal festivals which attract followers from across the nation. As you travel over our roads you’ll find informal jam sessions by the country stores, VFD/rescue squads, the courthouse and the neighbor’s back porch. The Crooked Road, Virginia’s Musical Heritage Highway transects our county. Events and festivals around Grayson County include the Whitetop Maple Festival, Multiple Fiddlers conventions including the Galax Fiddlers Convention, Whitetop Ramp Festival, Leaf and String Festival, Wayne C. Henderson Festival, Independence 4th of July celebration, Mathews Living History Museum Heritage Day, Grayson Wine Festival, Festival by the River in Fries, Baywood Pumpkin Festival, Mountain Foliage Festival and Grand Privy Race in Independence, Whitetop Molasses Festival and the New river Trail 50k. There are a variety of family practices as well as specialty practitioners in our area. Hospitals and medical centers in close proximity to Grayson County include Alleghany County Memorial, Twin County Regional Hospital in Galax, Wythe County Community Ashe County Memorial and Smyth County Community Hospital. The New River is the second oldest river in the world and is a National Heritage River. It offers canoeing, kayaking, tubing and fishing. It runs through Grayson County for about 30 miles. Grayson County offers great fishing throughout with many mountain creeks and streams stocked with trout. 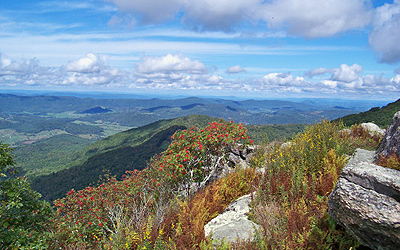 In the Mount Rogers National Recreation Area you will find the 5,792-ft Mount Rogers, the highest mountain in Virginia. You'll enjoy the Virginia Creeper Trail, a former railroad that is now a popular biking, hiking and horse riding trail plus the Appalachian Trail, numerous campgrounds and 3 wilderness areas. The George Washington National Forest and Jefferson National Forest together contain nearly 1.8 million acres, representing one of the largest blocks of public land in the eastern United States. The Jefferson National Forest itself is comprised of lands in Virginia, West Virginia and Kentucky. 690,106 acres of the Jefferson National Forest are in Virginia, a large part of which is located in Grayson County, including the Mount Rogers National Recreation Area. The Jefferson National Forest offers 950 miles of hiking and riding trails, including 300 miles of the Appalachian National Scenic Trail and the 68-mile Virginia Highlands Horse Trail. Matthews State Forest also provides an excellent representation of forests of Southwest Virginia. The Grayson County Recreation Park offers a swimming pool, several baseball diamonds, a paved walking trail, 1.2-mile nature walking trail and picnic area. This is truly the place to find your independence and freedom! Come check out Independence and Grayson County soon, and stop by our United Country office.